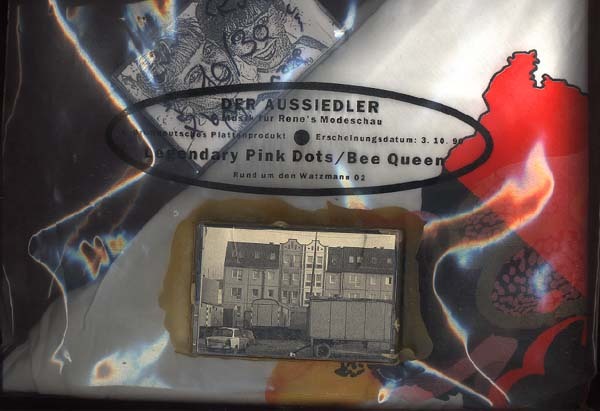 The Legendary Pink Dots/Beequeen, "Der Aussiedler"
The Legendary Pink Dots, "Potsdammer Spats"
Recorded for the fashion show Der Aussiedler featuring designs by Ren� Heid of Rund Um Den Watzmann. 1990 7" is packaged with a medium t-shirt and limited to 200 copies in a silk-screened sleeve. 1994 12" is also packaged with a shirt and limited to 200 copies in a silk-screened sleeve. A 1994 "sub-edition" was limited to 30 copies (15 of each format) and is subtitled 4 YEARS LATER. It comes with a different t-shirt from the first edition and other "gadgets", etc., with each of the 30 copies being unique and signed by all participants. It also includes a 6 track cassette with solo works from members of LPD and Beequeen, including "Kolomne (the Elke mix)" by Edward Ka-Spel and "The Day She Left For Good" by The Silverman.